Before heading home last night, I made one last stop at the Black Dragon pictographs since it has been a while since I was last there. Thanks to recent flash-flooding, the road through the canyon was rougher than I remember it. 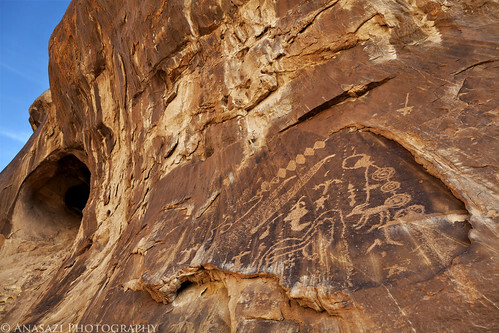 I wasn’t sure if the pictographs would be in the sun or the shade, but when I arrived I found that the panel was bathed in some nice late evening sunlight. I also found out just how well the alcove traps heat. The temperature outside was in the upper 90’s, and this alcove must have been at least 10-20 degrees hotter! I could really feel the heat coming off of the sandstone as I climbed up to this panel….I ended up not sticking around too long because of it. I’m guessing this would be a great place to warm up in the colder winter months. 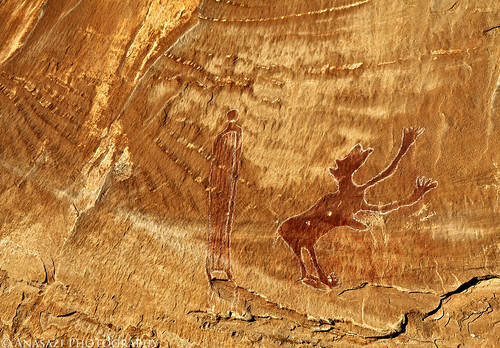 These two figures are found to the right of the well known ‘black dragon’ pictograph. 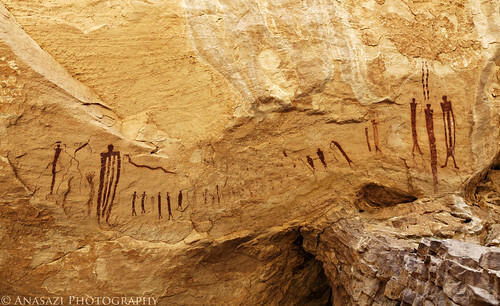 There is the interesting anthropomorphic figure on the left and the large creature on the right which looks like it may possibly represent a dog, which is common in the Barrier Canyon Style, but I’m not 100% sure on that so I’ll stick to just calling it a creature. What I like about this scene is the lines in the sandstone that seem to radiate towards these two figures. However, I don’t like that most of the pictographs in this area are outlined in chalk.